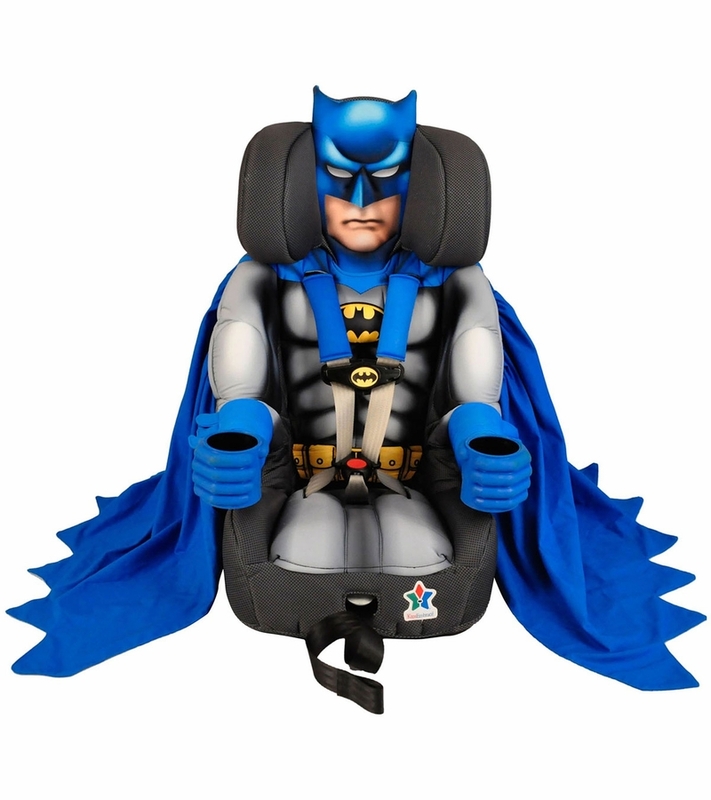 The Batman Deluxe Combination Toddler/ Booster Car Seat is designed with extended-use five-point harness and larger seat. This car seat accommodate kids 22 to 65 lbs, booster seat fits 30 to 100 lbs. 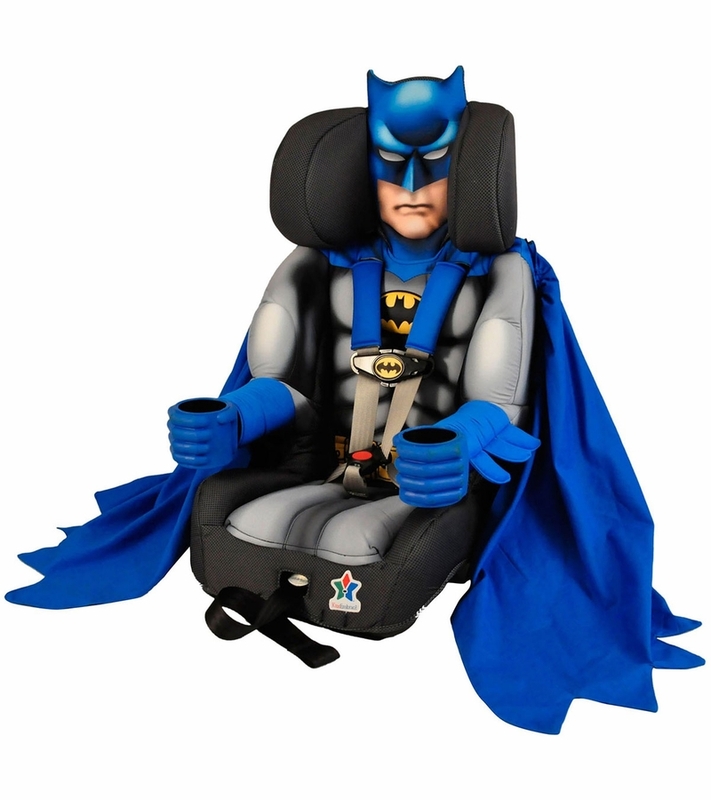 Featured are an easy-to-install LATCH connectors that have a quick push-button attachment/release, a new one touch recline system, and new high harness belt slots for taller children. The cool new wrap around cape blanket keeps child seat cool when child is not present and keeps child warm on colder days. 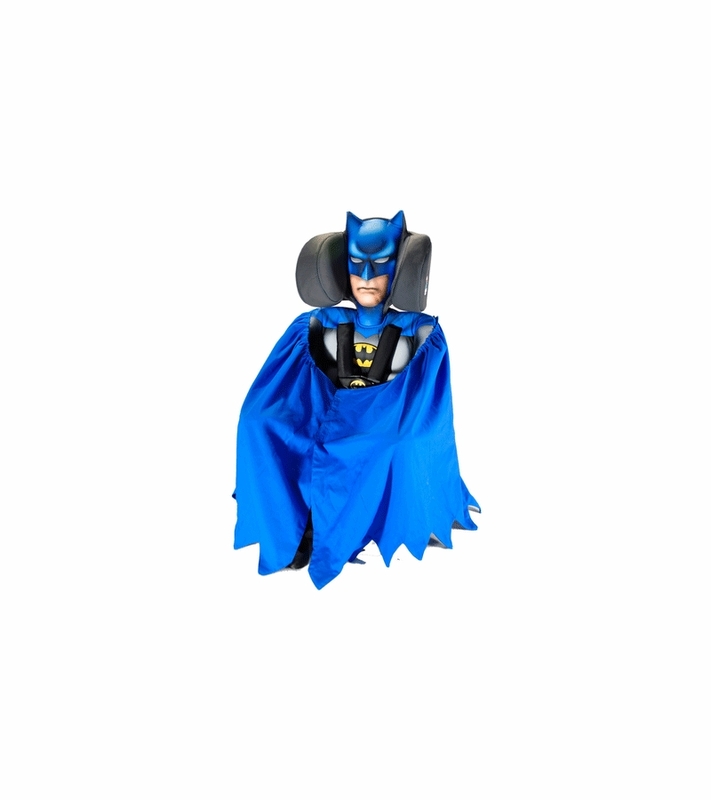 The Batman Deluxe Combination Booster Car Seat straps also have padded covers for added child comfort and one-handed harness adjustment - just one pull for a snug and secure fit. Included is a patented 2-position crotch strap that lengthens to accommodate growing kids, built-in belt guides, and straps also have padded covers for added child comfort. 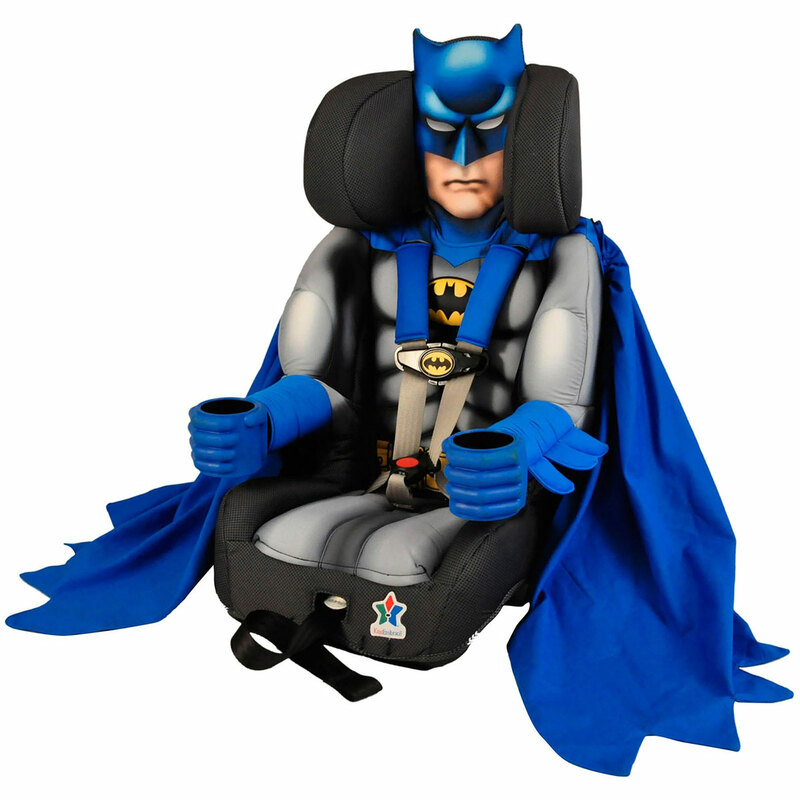 Contoured seat shell with two-position recline is shaped to support child's spine and legs in comfort, even on long car rides, deeper seat and deeper "wraparound" headrest provide superior side-impact protection and seats are equipped with high-density EPS foam which absorbs energy in the event of a collision. Seat cover can be easily removed and is machine washable. Headrest adjusts to three different positions to better fit your kids as they grow. Dual cup holders fit most Sippy cups. High-impact thermoplastic seat shell is engineered with ribbing and reinforcements for added extra strength and superior protection during a collision. Patent-pending high-position top tether system controls forward movement of the child's head during sudden stop or collision. Harnessed Booster Weight Limit: 22-65 lbs. Booster Car Seat Weight Limit: 30-100 lbs. My son is in absolute love with his new car seat! Our 4yr old daughter is in love with her new Batman car seat! I love it because she is safe and comfortable! She loves it because it's Batman of course! the best booster seat ever! The seat looks pretty and comfortable. Children are attracted by the cute cartoon character and lok forward to car ride. The harness could be easier for a child to undo. 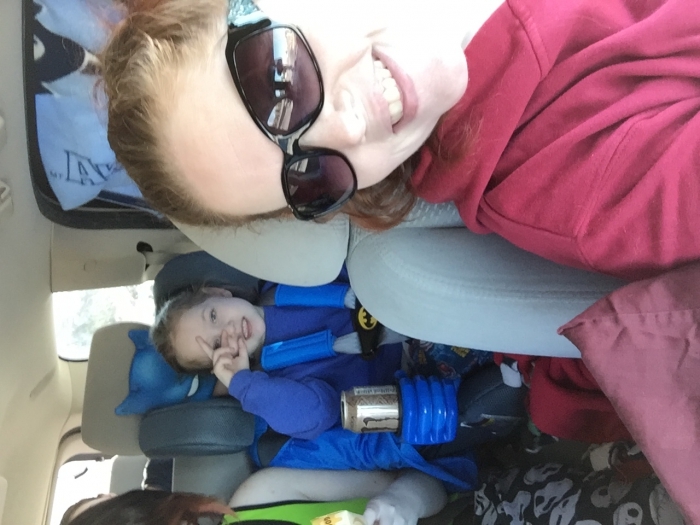 My daughter could undo her harness easily in her Britax Frontier seat, but need my help to take her out of th is seat every time I drop her off at school. The installation is a little tricky too. So far this is the seat I had to struggle to make sure it was tightly secured in place. The top slow for harness is low, I can see my daughter outgrow harness mode before she reaches 7. I would prefer her stay in harness for longer if possible as it is safer than shiuldr lap seat belt adults use. Other that that my daughter loves it dearly. ProsCute design, padding feels comfortable, height of headrest is easy to adjust. ConsHarness is hard to undo by the child, the installation is not easy compare to other ones I had, the highest shoulder slot for harness is too low, tall kids will outgrow the harness mode early because of it. The weight limit is lower than similar products too. This car seat is great. It has a longer harnessed height and weight. Along with being very easy to adjust. My daughter still ha a lot of growing room. & Spongebob being on it is a plus! ProsGreat design. Easy to adjust. ConsI don't like the anchor secure. Our son was very Happy with His new car seat. Happy 6 yr old . happy mommy.. Thanks Albee baby for the additional discount. My son LOVES this seat. His older brother is now in a booster (no longer 5 point) and I was afraid he would be jealous but since we have this seat , he doesn't care at all! Purchased this for grandson's birthday present. HE LOVES it. It's functional, comfortable and now the envy of all of his friends. My kids were so excited when they got their chairs. Well worth the money! Kids says chairs are comfy. First off 2 words FREE SHIPPING!!! I loved that it was a quick delievery in less than a few days and the product is exactly what I was expecting, not to mention the site is easy to manage and excepts coupon codes. 5stars for sure. Thank you. Very sturdy and my son loves it! My son fell in LOVE the first day when he seen the box from the UPS man! He NEVER wants to get out of it and the buckles are so easy to use because I have carpal tunnel so that helps a lot. I can't wait to have another child so I can get them one too! Totally worth the price for being the LAST car seat I would EVER have to buy!